Industrial Revolution emerged many improvements in manufacturing and service systems. Because of remarkable and rapid changes appeared in manufacturing and information technology, synergy aroused from the integration of the advancements in information technology, services and manufacturing were realized. These advancements conduced to the increasing productivity both in service systems and manufacturing environment. In recent years, manufacturing companies and service systems have been faced substantial challenges due to the necessity in the coordination and connection of disruptive concepts such as communication and networking (Industrial Internet), embedded systems (Cyber Physical Systems), adaptive robotics, cyber security, data analytics and artificial intelligence, and additive manufacturing. These advancements caused the extension of the developments in manufacturing and information technology, and these coordinated and communicative technologies are constituted to the term, Industry 4.0 which was first announced from German government as one of the key initiatives and highlights a new industrial revolution. As a result, Industry 4.0 indicates more productive systems; companies have been searching the right adaptation of this term. 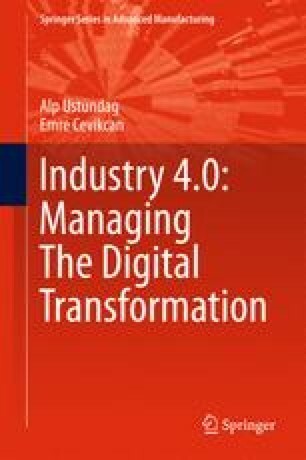 On the other hand, the achievement criteria and performance measurements of the transformation to Industry 4.0 are still uncertain. Additionally, a structured and systematic implementation roadmap is still not clear. Thus, in this study, the fundamental relevance between design principles and technologies is given and conceptual framework for Industry 4.0 is proposed concerning fundamentals of smart products and smart processes development.